The innovative Bradley Base System lamp bases involve the construction of a hollow lamp base from opalescent glass pieces foiled and soldered together. When you then install the handy wiring kit into the cavity, that light source within the lamp base can be turned on or off when you wish, independent of the lamp itself. Some designs are shown displayed with a fabric lampshade perched on top. If you wish, you can mount a 16" or 18" diameter stained glass shade on it instead, provided of course that you chose a compatible design. These packages include sets of patterns and instructions. The glass must be purchased separately. We have created our own glass packages for these patterns to save you the time and guesswork of choosing the glass yourself. Most of the Bradley Base lamp bases are built around the use of a re-usable polystyrene lamp base form. The form is soft enough so that pins can be stuck into it to hold the glass into place as you build the lamp base, but sturdy and durable enough that you can reuse it many times to build the same or different lamp bases. If you have purchased and used any of our lamp forms and patterns, you will notice a similarity in the method of construction. Two (2) repeats, 296 pieces. Includes the pattern for the lampshade shown. Also coordinates with the Belted Rose Lampshade Pattern (LB22-1) below. Two (2) repeats, 324 pieces. Coordinates with the Peony Lampshade Pattern (not included). Requires turtlebacks, which we do not carry. Lampshade pattern included. This base pattern also coordinates with the #2977 Morning Glory Lampshade Pattern (LB22-13). Includes six (6) sets of of four (4) dragonfly wings. Lampshade pattern not included. 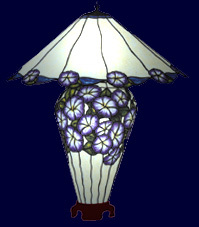 Includes the pattern for the lampshade shown. This base pattern also coordinates with the Bradley Base Grapevine Lampshade Pattern (LB22-18). 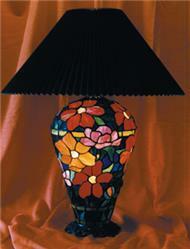 Using this packet, you can design and fabricate your own original stained glass lamp base designs. The illustrated instructions show you how the Bradley Base people do it. Cartoon pattern sheets, form-dividing circles and instructions are included. You simply divide the form into the number of repeats desired, draw one design and transfer it to the form.